E Karahan, G Arikan, M Soylev, A Osman Saatci. Bilateral Idiopathic Epiretinal Membranes Associated With Multiple Peripheral Neurofibromas In A Young Adult. 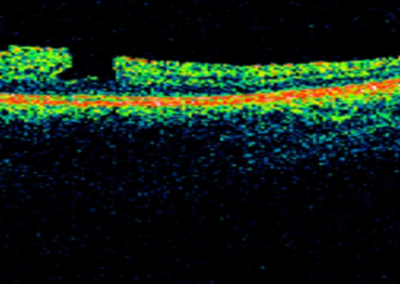 The Internet Journal of Ophthalmology and Visual Science. 2006 Volume 5 Number 1. A 28-year-old woman with multiple peripheral neurofibromas had undergone an ophthalmologic consultation. Bilateral idiopathic epiretinal membranes were detected without any other ocular changes. Though our patient did not meet the criteria set for Neurofibromatosis Type 1 and Neurofibromatosis Type 2 it is well possible that bilateral epiretinal membranes may be in the disease spectrum. We hereby report a 28-year-old woman who had biopsy-proven multiple peripheral neurofibromas without any other sign of NF-1 or NF-2, and had bilateral epiretinal membranes without any other ocular sign. A 28-year-old woman with biopsy-proven multiple peripheral neurofibromas were referred to us for ophthalmologic consultation. She developed several painless lumps in her extremities and her neck since four years of age. 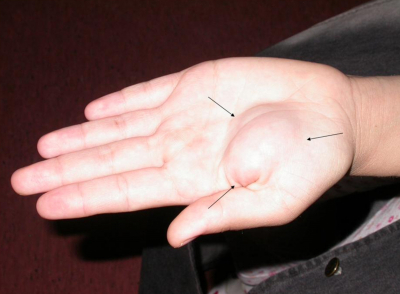 Histopathologic examination of an excised lump located at the right side of her neck showed findings consistent with neurofibroma. However, Horner syndrome characterized with miosis and right ptosis ensued following this surgery. On our examination, best-corrected visual acuity was 20/80 OD and 20/25 OS. The right upper eyelid was ptotic and the pupil was miotic. There was no afferent pupillary defect. Color vision was normal bilaterally. Slit-lamp examination was unremarkable OU. Ophthalmoscopy disclosed macular epiretinal membranes in both eyes and pseudohole formation in the left eye (Figure 1a and b). Optic coherence tomography demonstrated epiretinal membranes exerting traction on macula and causing secondary foveolar detachment (Figure 1c and d). 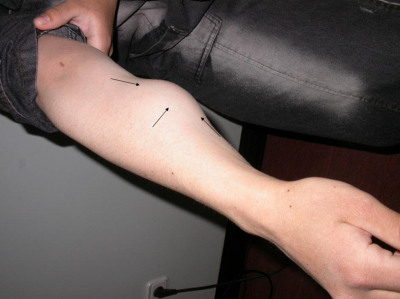 Physical examination yielded several neurofibromas scattered throughout the body and extremities (Figure 2a and b). There was only one cafe-au-lait spot on right axilla (Figure 2c). Despite physical and neurologic examinations together with laboratory and radiologic investigations no other signs relevant to neurofibromatosis type I and II were detected. Our diagnosis was isolated multiple neurofibromas associated with idiopathic bilateral epiretinal membranes. 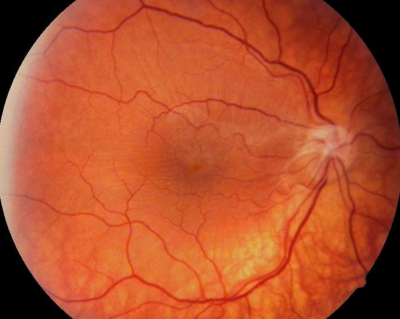 The patient denied surgery for epiretinal membranes and is under follow-up. 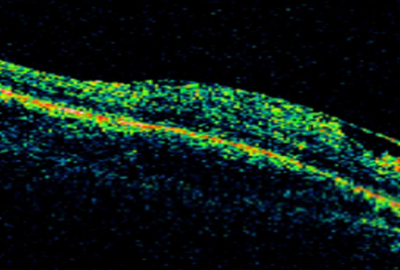 Epiretinal membrane formation was previously described in patients with NF 2. 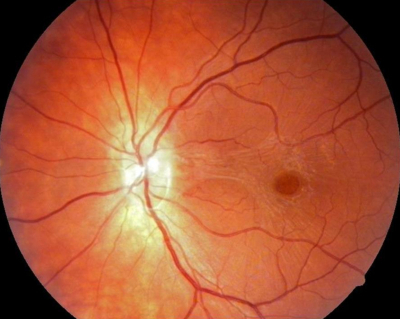 Landau and Yasargil3 evaluated prospectively fundus changes in six patients with a confirmed diagnosis of NF 2 and found that four of them had epiretinal membranes. They concluded that epiretinal membranes are possibly of congenital origin similar to those previously reported in healthy children and young adults. Meyers et al.4 reported that in 12 of 15 patients with NF 2 an epiretinal membrane in the macular or paramacular area was present. Also one patient had an epiretinal membrane in one eye and CHRPPE in the other eye. They underlined the fact that most of the epiretinal membranes in the macula did not affect visual acuity and speculated that in NF 2, in response to pathophysiologic factors that cause proliferation of neural crest and other cells elsewhere in the nervous system, cells of neural crest or neuroectodermal origin at the vitreoretinal juncture or in the retina proliferate or develop abnormally resulting in epiretinal membranes at an early age. CHRPPE, and epiretinal membrane represent a spectrum of lesions from vascular malformations at one end to CHRPPE at the other, and some authors have postulated that epiretinal membranes in NF 2 patients are form fruste of CHRPPE.6 Vianna et al.7 reported a single case with bilateral CHRPPE and NF 1 and Destro et al.8 reported that two of their 5 patients with retinal tumors and NF 1 had CHRPPE. Though our patient did not meet the criteria for NF 1 and NF 2 she had multiple peripheric neurofibromas. It is well possible that idiopathic epiretinal membranes may be in the disease spectrum. 1. Wise GN. Congenital preretinal macular fibrosis. Am J Ophthalmol 1975; 79: 363-5. 2. Laatikainen L, Punnonen E. Idiopathic preretinal macular fibrosis in young individuals. Int Ophthalmol 1987; 10: 11-4. 3. Landau K, Yasargil GM. Ocular fundus in neurofibromatosis type 2. Br J Ophthalmol 1993; 77: 646-9. 4. Meyers SM, Gutman FA, Kaye LD, Rothner AD. Retinal changes associated with neurofibromatosis 2. Trans Am Ophthalmol Soc 1995; 93: 245-52. 5. Ragge NK, Baser ME, Klein J, Nechiporuk A, Sainz J, Pulst SM, et al. Ocular abnormalities in neurofibromatosis 2. Am J Ophthalmol 1995; 120: 634-41. 6. Schachat AP, Shields JA, Fine SL, Sanborn GE, Weingeist TA, Valenzuela RE, et al. Combined hamartomas of the retina and retinal pigment epithelium. Ophthalmology 1984; 91: 1609-15. 7. Vianna RNG, Pacheco DF, Vasconcelos MM, de Laey JJ. Combined hamartoma of the retina and retinal pigment epithelium associated with neurofibromatosis type 1. Int Ophthalmol 2001; 24: 63-6. 8. Destro M, D'Amico DJ, Gragoudas ES, Brockhurst RJ, Pinnolis MK, Albert DM, et al. Retinal manifestations of neurofibromatosis. Diagnosis and management. Arch Ophthalmol 1991; 109: 662-6.